Evie is living on borrowed time. She was diagnosed with terminal cancer several months ago and told that by now she’d be dead. Evie is grateful for every extra day she gets, but she knows that soon this disease will kill her. Until, miraculously, she may have a second chance to live. All Evie had wanted was her life back, but now that she has it, she feels like there’s no place for her in it—at least, not for the girl she is now. Her friends and her parents still see her as Cancer Girl, and her boyfriend’s constant, doting attention is suddenly nothing short of suffocating. Then Evie meets Marcus. She knows that he’s trouble, but she can’t help falling for him. Being near him makes her feel truly, fully alive. It’s better than a drug. His kiss makes her feel invincible—but she may be at the beginning of the biggest free fall of her life. A serious, intense, and heart-wrenching look at illness and addiction. In Amy Reed's latest heart-wrenching contemporary novel, we meet Evie, who dreams of the cheerleading moves she used to do, dates the school's hottest jock, and is loved by her family. Now Evie is Cancer Girl, and her best friends Stella and Caleb are also fighting cancer. The contrast between Evie and Stella is spectacular, and reader's will love being in on their powerful friendship. But then Stella gets sicker, and Evie, miraculously and mere weeks from potential death, gets better. While her family and friends are overjoyed that Evie mysteriously recovers from cancer, she is still coping with loss and the dramatic changes that she has undergone during her time in the hospital. Evie isn't the same girl she was a year ago. That girl doesn't exist anymore, except in other people's memories. And the people around her are taking it just as hard as she is. That's when Evie discovers that recovery can be the hardest part of an illness. Having to face her family's expectations and those of her classmates and teachers quickly becomes too much for Evie. How can they expect her to just become exactly who she was before the cancer? With everyone expecting the impossible, Evie finds it harder and harder to keep up with everyday life. She meets a new friend, Marcus, and they start dating, which becomes the highlight of Evie's days. Evie's highs become very high, while her lows are depressingly low. What I loved: This is not THE FAULT IN OUR STARS. There is no bright side to things, despite Evie's fantastic recovery. Evie finds it impossible to cope with her new life - the life that she never expected to have. The expectations of everyone around her - that life should just go right back to "normal" and Evie should go back to being the good little cheerleader she always was - are enough to send her off the deep edge and into some serious trouble. This is not a feel-good chick lit contemporary romance. This is a serious, intense, painful story about the power of addiction and the changes that severe illness can have on an entire family. What I wanted more of: Evie's parents seemed surprisingly neglectful. I understand that they are representative of some parents, especially those who aren't used to their good girl going bad, but they really dropped the ball. Things escalate quickly with Evie once she starts getting into trouble, and I just expected her parents to enforce some consequences and punishments sooner. 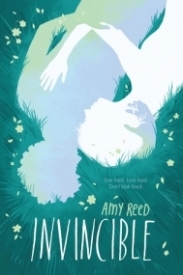 The verdict: For fans of Ellen Hopkins and Laurie Halse Anderson, INVINCIBLE is a powerful story about a girl who makes the wrong choices and suffers for her mistakes. Evie was diagnosed with terminal cancer months ago. She's exceeded the number of days the doctors had given her to live so now she's just grateful for every extra day she gets. Until she miraculously starts getting better. For so long she's been The Girl with Cancer to her family and friends and getting them to see her as just Evie seems impossible. Then she meets Marcus, someone who doesn't know her past, and he makes her feel alive. This book ended up being a faster read than I thought it would, considering the subject matter. There was definitely a before and after feel to it, before the miracle vs after the miracle. The before parts, when Evie was in the hospital, were both heartbreaking and yet also fun. It was a children's cancer ward and the author did a good job of reminding the reader of that when things were getting too lighthearted. The bond that had developed between Evie and two other kids, Stella and Caleb, was really nice and fun to read. The whole 'before' part had a bit of a Red Band Society feel to it. The 'after' part almost seemed like a completely different book. Evie was, understandable, such a different person from in the first part. She had accepted death and it didn't come. All of a sudden she had to deal with the fact that she did likely have a future and that she was expected to fit back into society outside the hospital walls. She wasn't adapting well and everyone just seemed to ignore it or make excuses. Part of me sympathized with Evie but the more she used her cancer as an excuse for her behavior, the more she lost me. Besides cancer, the book also touched on drug use/addiction, depression and eating disorders. There were a lot of issues going on and it felt a little overwhelming. There wasn't enough time to give all the issues the attention they needed. The theme of old vs new continued through the whole book. Old Evie vs new Evie, old friendships vs new friendships, old romance vs new romance. Will, her boyfriend who stuck by her through everything, started off as really sweet and thoughtful while she was in the hospital and he did his best to understand New Evie, but he came across as a little smothering and condescending at times. Marcus, the new boy Evie met, was more of a mystery. He didn't know about her past so he could easily accept New Evie. I could see why Evie wanted and needed someone who didn't know about the cancer and who wouldn't treat her like she was about to break. This was the first book in, I believe a duology, so it will be interesting to see what happens to Evie, Marcus and everyone else in the second book.